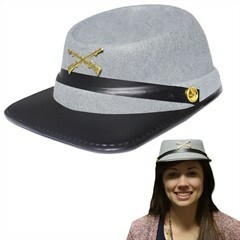 Travel down to the past and to the south to become part of the army with our Confederate Hat! This Confederate Hat is perfect for Halloween or war reenactments! Our awesome Confederate Hat is made of felt and is one size fits most adults. Our Confederate Hat is priced per hat. Please order in increments of 1 hat.